Is direct mail still relevant for banks and credit unions? What proof do I have that it remains relevant? 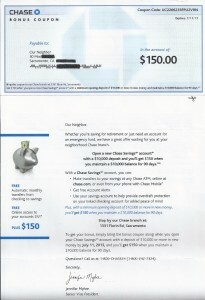 Chase continues mailing its self-mailer promoting checking and savings accounts to millions of consumers across the country. If direct mail wasn’t working for Chase, it would cease producing and sending these mailers. Very few things seem certain in life but one of them from my perspective is that periodically a self-mailer from Chase Bank will appear in my home mailbox. The marketing team at Chase is relentless in its pursuit of more deposit customers – especially checking customers. They are willing to spend big money for direct mail and willing to test, test, and test to see what works and what has stopped working. 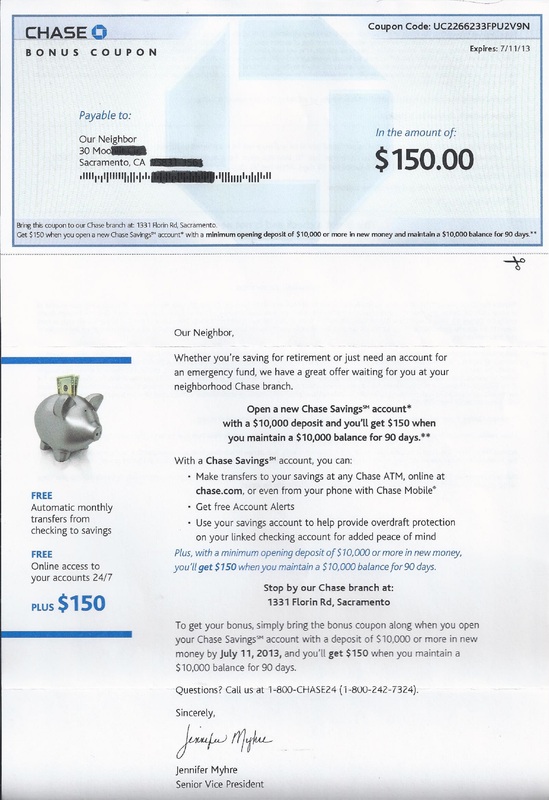 Apparently Chase’s now familiar self-mailer format works while continuing to be tweaked and tested to improve response – or at least sustain it. And now Chase is dangling a $350 cash bonus in front of me. 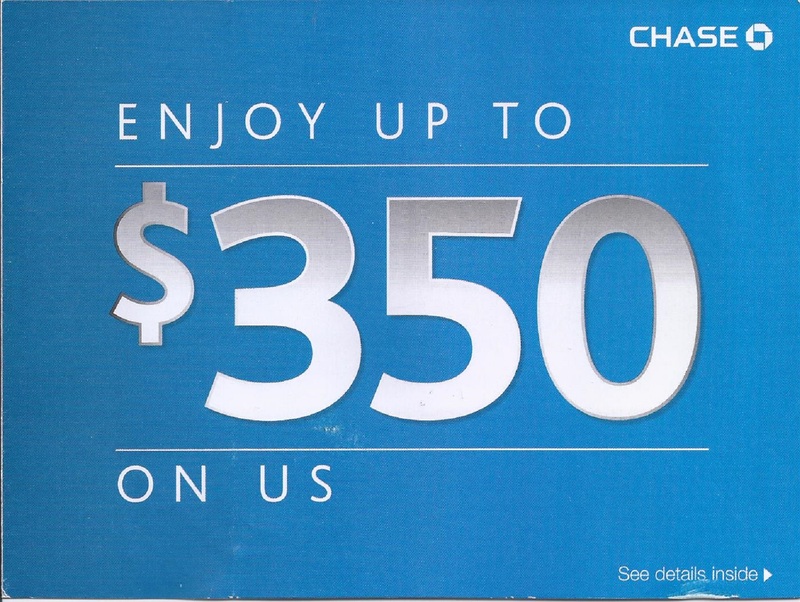 Here’s the most recent offer from Chase’s marketing team. What makes this latest offer different is that it is split between two products – a checking account and a savings account as seen below. I can receive $200 for opening a Chase Total Checking account and another $150 for opening a Chase Savings account for a total of $350. With this offer I can choose one or both accounts – it’s my choice. 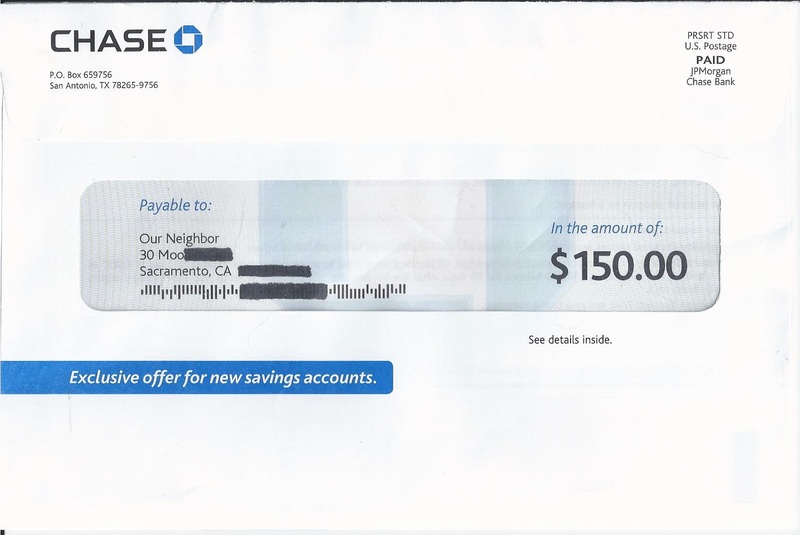 I suspect that some prospects may have received a similar self-mailer with a slightly different offer – get $350 when you open both a checking and companion savings account. Such an offer would be part of a typical testing matrix used by savvy direct mailers like Chase. This particular mailing was preceded a couple of months ago by an envelope package from Chase. 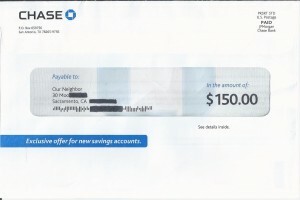 Arriving sometime in late May or early June, it was a $150 cash bonus offer for opening a Chase Savings account. Here’s the outer envelope with the offer visible by combining the bonus amount seen through the window with the teaser copy below the window. Inside the envelope is a simple, one-page, oversized letter with bonus coupon at the top. You’ll note by scanning the letter copy that Chase has provided the address of its nearest branch. The same branch address appears in the most recent self-mailer. Branches remain an integral part of Chase’s retail delivery strategy and it wants to ensure that non-customers like me are familiar with the location of its nearby branches. So why is Chase such an aggressive user of mail, particularly in California? It might be due to the fact that, unlike Wells Fargo and Bank of America that have their roots in California, Chase arrived in California very late – having acquired Washington Mutual’s massive branch network in September 2008. Saturating the California market with direct mail over several years is an excellent way of communicating and establishing a strong presence in the state. Plus, unlike intangible TV and radio spots and social media, direct mail has a much longer shelf-life and can be shared with others. You might say it’s sticky. If your bank or credit union isn’t using direct mail, you should consider testing it. ACTON Marketing has clients that have been using direct mail continuously for years. In addition to formats, creative, timing, and offers, another relevant issue concerns the number of times you should solicit an individual or household before dropping them from the mailing list if they don’t respond. Is there some magic number here? Or, like Chase, do you continue mailing, hoping for that major lifestyle change to occur that makes the prospect more likely to respond the next time? This issue has been debated for as long as I’ve been in bank marketing which goes back to the mid-1970s. As long as your direct mail creates a satisfactory response – resulting in new accounts opened by current and new customers – you continue mailing. This is why ongoing testing is so critical. Direct mail obviously works for Chase…it will work for your bank or credit union as well. By the way, in my April 25, 2013 blog I compare Chase’s older self-mailer with its tipped-on bonus card against the current format with the die-cut, removable card. You can read it here.